You may have just started a run on the Kroop's warehouse. go find a pair of Snowboarding goggles. 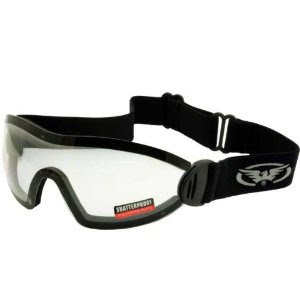 Great peripheral vision and designed to be lightweight, windproof, and work well in snowy conditions. Plus they block that area around the eyes which is beginning to blister and hurt. I just ordered skydiving and bicycling goggles. We'll see if they're any good for winter riding. For an extra 10% off. 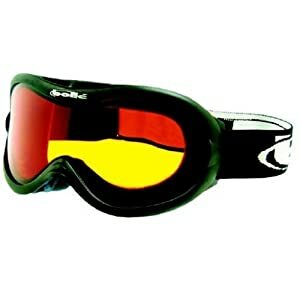 ive tried skydiving goggles for skiing before. worst idea ever. last year i used a pair of Bolle sharks ($25 at rei). they were so good, that winston ate em on me. i bought another pair at a ski lodge in galena a few weeks ago, again $25. this time with the yellow lense. much better than the red i had. good deal, good product, decent peripheral (tho expect some limitation). I asked at REI but they said they didn't have anything with clear lenses . . .
they don't look much different from the ones I bought in terms of surround. I bought myself a pair of Aviators two weeks back, and I'm finding that their large coverage area is good for winter biking. No peripheral vision issues either. But only good during daylight hours. I've had it with icicle eyelashes and just bought me sum! Don't know exactly how they'll do for winter riding. I do know I'm tired of feeling homicidal every time the rubber nosepiece pops off my current POS riding glasses (Nashbar or Performance cheapos). I can't imagine that these won't me at least some margin more comfortable than having a bare plastic edge on the bridge of my nose. Need to see how they handle fog. I will absolutely post a review once I've tried them.